This is the second article in my series on identifying the many styles of oriental dance. Once again, let me state that in no way do I consider any of these descriptions to be a “definitive view” of belly dance in it’s myriad forms…but I do hope this series of articles can provide a thumbnail-sketch frame of reference for belly dance fans, students, and also function as a jumping off point for dance fans and curious dancers of all styles. Under the headings of each belly dance genre, I have described the movements, attitudes and costuming connected to these style, and also listed the names of well-known dancers (and in many cases, legends) so that you, dear reader, can do more research yourself, or just spend a few hours getting lost on Youtube, seeing these amazing performers who practice all aspects of belly dance, in action. LEBANESE: Lebanese oriental dance is a unique and stunning style. Lebanese dancing incorporates many types of technique: subtle and internal, and quick layered shimmies, but also utilizes movements that are more splashy and athletic. Technique such as kicks, deep back-bends, splits and even Turkish Drops are frequently used. Because of the range of movements, to the untrained eye, Lebanese dancing might almost appear as though it was a love-child of Egyptian and Turkish Oryantal- but it’s very much it’s own breed. Much of the music often used is upbeat and quick-paced, even the typically slower portions such as taxims and chiftetellis are played a bit more up-tempo, and the dancers actions reflects this. Lebanese belly dancers tend to use a lot of floor space in their performances, and many shows-even those performed in a large theater or outdoor arena- include a section where the performer prances through the audience, selecting people to get up and dance with her. Sometimes when the dancer is encouraging audience participation, she will encourage audience members to form a dabke line, other times, she dances with a cane. Dancers using canes in a show routines don’t necessarily use folkloric music or costumes while doing so; and I have also seen a number of dancers include a khaligi segment in their shows –either entering in a traditional Saudi thobe after a costume change or simply throwing on a thobe over a cabaret costume and dancing Gulf-style for just one song. I have also seen Lebanese dancers perform sword pieces with floor work. Finger cymbals are used at the discretion of the dancer, and taxims are livelier and less introspective than Egyptian style, frequently performed with a veil, and often with extended segments of floor work. Drum solos often include the spine-snapping torso locks popularized by Lebanese superstars Samara and Amani. Both of these women also are well known for making their shows into theatrical spectacles, using many back-up dancers, frequently changing costumes, and exploring fusing belly dancing with other dance forms. Amani has done everything from a 1940’s/ Egyptian Golden Age vintage tribute to an Andalusian piece, while Samara once did Tahitian tableaux, which included a set with flaming torches and men in sarongs bearing gigantic spears, staging a mock battle! Interestingly enough, in my opinion, it seems as though Lebanese dancers use a wider range of music than their Egyptian or Turkish counterparts, incorporating classical or popular music from Morocco, Egypt, Syria, Saudi Arabia and other Gulf States, France, and many other countries as well as from their own. Typically, older Lebanese costuming was dripping with fringe, making it appear extremely thick and lush, and often using huge, chunky beads as opposed to smaller glass seed beads and bugle beads. Skirts were both straight and/or slitted, or circle-skirts made of voluminous sheer chiffon…and most of the time, Lebanese dancers are never without their high-heels. Current trends in Lebanese costuming run the gamut from heavily fringe-laden to very sleek, but can also veer off into downright crazy, verging on glamorized versions of ultra-skimpy club wear. These more risqué costumes are obviously inspired by popular rock and hip-hop videos and high fashion. In my opinion, another reason the envelope gets pushed so often in Lebanese costuming is because Lebanon is a very European-influenced country, and also predominantly Christian-as opposed to Muslim- and therefore more liberal and less conservative. Some examples of outré modern Lebanese belly dance costuming that I’ve seen include a one-shouldered, shredded leopard-print cave-girl look complete with furry leggings, micro- mini-skirts worn with a regular bedlah, one-legged jumpsuits with huge cut-outs, and even hot pants and stiletto-heeled platform boots! Like their Egyptian counterparts (and quite unlike most Western dancers) many well-known Lebanese dancers have been known to grab a microphone in the course of a show and say a few words to the audience, thanking everyone for coming, pointing out VIPs in the crowd, joking around, and introducing their orchestra or a guest singer. Lebanon has contributed many world-class artists to the world of Oriental dance. Some who are no longer with us are the iconic star of stage and screen Nadia Gamal and Lebanese-American choreographer Ibrahim “Bobby” Farrah. Badia Masabni, known as an early innovator of Oriental dance, was a Lebanese dancer (some sources say Syrian) who relocated from Beirut to Cairo in the early part of the last century (1920’s) and opened The Casino Opera, a prestigious nightclub where celebrated Egyptian Golden Age dancers like and Samia Gamal and Tahiyya Carioca got their start. Some of the Lebanese superstars of the nineties include Samara, the late Danni Boustros, Amani, Narriman Aboud, and Hawayda Hashem; and more recently, Dina Jamal. Many Western dancers specialize in Lebanese belly dance, including Switzerland’s Meissoun, and from the USA, Mark Balahadia and Lotus Niraja. 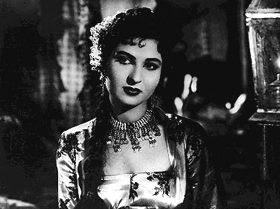 EGYPTIAN GOLDEN AGE: (Also referred to as “Egyptian Golden Era”, “Golden Age Of Egyptian Cinema”). The Golden Age style of Egyptian oriental dance was popularized in movies made in Cairo, which was the Hollywood of the Middle East, spanning roughly from the late 1930’s through the early 1960’s. It was during the Golden Age that Egyptian dance began transitioning from its traditional balady style to the form of raqs sharqi we know today. During this time, Cairo was rife with talent and home to scores of dancers, actors, musicians and singers. Many became internationally known, and their influence is felt to this day, including the work of these composer/singer/actors Farid El Atrache, Abdel Halim Hafez, and Mohammad Abdel Wahab; legendary vocalists Om Kalthoum and Asmahan, who also happened to be Farid Al Atrache’s sister! In that period, Cairo was a city full of intellectuals and ex-patriots, with a considerable Western population. The films being produced during The Golden Age reflected popular American musical cinema, with a decidedly oriental twist. The plots of these movies were usually some sort of spin on “boy meets girl”, almost always had a happy ending, and were filled with lavishly produced singing and dancing numbers that rivaled Busby Berkeley’s cinematic work. Two of the top stars of these films, Tahiyya Karioca and Samia Gamal- and the entire style of dancing that exemplified The Golden Age-actually all had their roots in Cairo’s famous nightclub, The Casino Opera. Opened in 1926 by Lebanese-born dancer and impresario Badia Masabni, the Casino Opera was an oriental re-interpretation of upscale European cabarets. The Casino Opera catered to Cairo’s international “glitterati”- the afore-mentioned ex-patriots and intellectuals, and also visiting royalty, diplomats, military officers, and well-heeled tourists. With a show tailored for their global clientele, the club featured large orchestras, famous singers and comics, and also a spectacular floorshow with a chorus of dancing girls lead by Badia Masabni herself. Many credit Masabni with re-imagining oriental dance, taking it out of its original form - earthy, folksy balady- and adding in Western elements to make her sophisticated audience happy. Some of her innovations include the use of veils, the formation of a dance chorus (as opposed to a single soloist), and changing traditional arm positions from simple and folkloric to elegant and ballet-like and/or very serpentine and stylized. She also changed the dancer’s center of balance, and made it higher by including movements of the upper torso. Because of the large performance area in the club, Masabni’s solo or duet dancers tended to cover a lot more space than their straight balady predecessors, who usually stood pretty much rooted to the spot, not traveling much. Masabni not only choreographed the dancers in her club, but she also hired others to choreograph her shows, like Isaac Dickson, whose Western stylizations had a lasting impact on the entire evolution of dance itself. She also worked a lot with master Egyptian choreographer Ibrahim Akef, whose oeuvre was definitely oriental, but flavored with a contemporary essence at times. 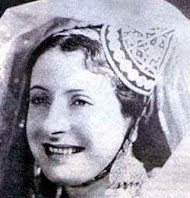 Akef routinely made dances for the films of his famous cousin, Naima Akef, who was a huge celebrity during The Golden Age, and the star of “Tamra Henna”, one of the best-known films of that time period. Ibrahim Akef lived such a long and productive life that he worked with many of Egypt’s contemporary stars, as well. As a side note, I took a series of classes and privates with him in 1999, when he was, I think, 98 or 99 years old and he out-danced me easily! The Golden Age style of dancing, sometimes called raqs al hawanim (“dance of the ladies”) by Egyptians, can be identified by it’s sensuous and almost heavy balady-type movements- think big, luxuriant hip circles- and a languid sort of dancing that the performer relaxed into, almost behind the beat. The posture of these dancers was less erect than their contemporary sisters, with many of the movements performed leaning back considerably more than dancers do today. Presentation was deliberately flirtatious and seductive, with coquettish gestures, such as a dancer caressing herself subtly or playing with her hair. The movements of balady were refined and elaborated on, and performed on he balls of the foot as opposed to on flat feet. Naima Akef, Samia Gamal and Tahiyya Carioka all had distinct styles: Akef’s was precision perfect with crispy hips, and a pert, sassy stage presence and crackerjack use of finger cymbals; Gamal was like an Arabic Ann Miller, with a winning smile, ballet-like carriage, sharp turns and large, sweeping movements including strong arabesques; Carioka was subtle, simmering and laid back, with an almost bashful presence that belied her sensual, superlative fluidity. In spite of the differences in these three dancers individual approaches, the feel of the movements the three share in undeniably connected. Another of Masabni’s modernizations was costuming her dancers in two-piece outfits in order to appeal to her European audience, as opposed to the simple, traditional floor-length dresses and hip sashes that had previously been conventional for Egyptian dance. Of course, this innovation translated fantastically onto the silver screen. Typical Golden Age costuming is spectacular and feminine, with flowing, frothy, multi-layered chiffon skirts, two-piece bedlah with draped (as opposed to hanging) fringe, and a decorated connector-piece running horizontally between the bra and the belt, designed to hide the navel. Many of the costumes had long sequined gauntlets worn on the forearms; some were festooned with hanging fringe. In the fashion of the day, the costumes had brassieres with pointed “torpedo” cups, and many of the tops featured shoulder epaulettes or small cap sleeves. Samia Gamal, taking cues from Jane Russell and Marilyn Monroe, even wore strapless tops. Modern takes on balady dresses and pantaloons were also popular but made film-worthy and glamorous by being constructed of shiny, sheer fabric embellished with paillette sequins. Many dancers wore high heels, and it’s said that Samia Gamal was the one who began this trend- she apparently appeared wearing them onstage in live shows as a status symbol, to prove she could afford them! The hairstyles of the dancers in the Golden Age films run the gamut from traditional (braids, or hair covered with a scarf or long sheer veil) to Naima Akef’s cute poodle-cut, Samia Gamal’s 1940’s-style waved pageboy bob, and a young Nagwa Fouad’s teased and sprayed Jackie Kennedy-style helmet ‘do. Aside from “The Big Three” (Gamal, Karioca, Akef) there were many other popular dancers featured in Golden Age films, such as Nabaweya Moustapha, Katy, Hoda Shemsaddin, Na’Amat Mohktar, Nagwa Fouad, Camellia, Zainab Alouwi and Nelly Masloum. Please note that most of the spelling of these names may very wildly due to phonetic translations. After reading your articles, I go to you tube to familiarize myself with the people of days gone by. I just finished watching Ibrahim Akef. Watching him teach was great. What a wonderful memory you must have to have known these great artists. I was curious, what relation, if any, is Naima Akef? I must say, I enjoy the old ways of dance as well as the new. Growing up in the 50s and 60s, watching these old classic movies made my young heart dance with delight. It was so mysterious to a rural farm and ranch girl living in oklahoma. Thanks for sharing the people behind the scenes and the artists who entertained me and many others. The folks of the theater world have given so much of themselves. I really respect and appreciate you and the many who take us to other places we might have never known,gypsy. that is so great you go to Youtube, that's why I put lists of names at the end of the articles. It's such a great resource! Luv the article! Its a treasure! Where could one get full length movies, with English subtitles, of Golden age Egyptian cinema? Nice!! I’d like to share this with my group as we are currently studying Golden Age and have each been assigned a dancer to research. Mine is Naima Akef!! 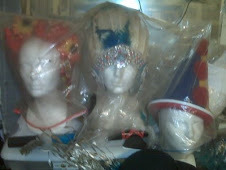 DINA’S COSTUMES UP FOR SALE ON EBAY!